About Me: Your messages said Powerfully and Direct. Just say it Simply and Just say it in Black! 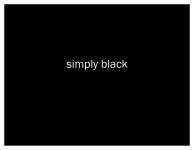 Simply Black is glad to help you with your custom requests. Thanks for visiting.